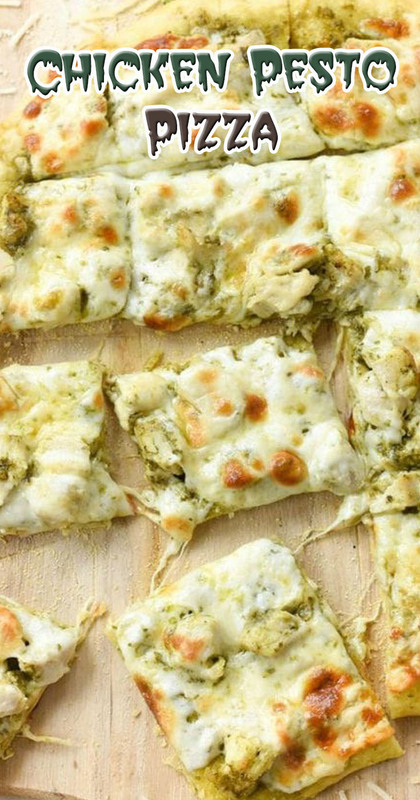 Mix 2 Tablespoons of pesto with cut up chicken or use leftover Pesto Chicken. Mix 2 Tablespoons pesto with pizza sauce or use straight pesto as sauce. Cover pizza paddle or backside of a cookie sheet with a light layer of cornmeal. Roll out dough (may need to add a little extra flour). Add a layer of sauce or pesto, pesto chicken and then cheese. Add a sprinkling of Parmesan cheese at the end. Slide pizza from paddle or cookie sheet into oven onto the hot pizza stone. Cook in oven preheated to 450 degrees for about 10-12 minutes until cheese is bubbly and lightly browned and edges of crust are golden brown.